Implementing common form requirements seems hard or outright impossible in React: dynamic forms, real-time feedback, nice UX. Is it the time to ditch React and go back to what works? After all, the jQuery forms used to work, right? You know interactive forms made in React can be amazing, you’ve seen them… you just don’t think YOU can make these. What if you knew how to Reactify your forms? What if you knew exactly how to put in place the forms experience your users deserve, in React? Your designer would be happy, too! And most of all, you will be happy with React helping you. What if you knew how to approach any form, with confidence? You could google for each specific case, but that doesn’t scale. Do you want to be an asking machine all the time? It’s true, people get stuck with forms in React all the time… but it doesn’t have to be like that. Learn to breeze through your forms in React, with my handbook. Change how you think about forms. Get a “feel” for them. You’ll learn to breathe life into common form structures and patterns that many forms make use of. You also get all the code. And the best part? Instead of being a bunch of .js files, everything is on JSBin that you can play with right in your browser. Buy the handbook, and you’ll be enjoying your “new” interactive forms in no time. Gosha’s previous articles on React and forms are among the links I most frequently recommend to help answer questions from learners. Now, Gosha has put together the definitive guide to managing forms in React. This is a must-read for any React dev, and even non-React devs will benefit from the information as well. Highly recommended! The book has 116 pages. You can read it over the weekend. Get a free sample of The Missing Forms Handbook of React. The handbook is not aimed at teaching you React from scratch — you should know some React already. It’s also not about every possible form requirement. Instead, it’s about showing you the common patterns as a demonstration of React thinking. Just finished reading @goshakkk Missing Forms Handbook of React and I could already apply it with much success. Very practical and easy to follow. If you aren’t fully satisfied, I will give you a 100% refund. Lot’s of insights! I loved your book. Your book (as your blog) is great and very simple to understand event for a non-native english. I just finished having a full read through of the book and I have to say it has been very insightful. Thank you very much for consolidating a lot of scattered information into a cohesive centralized place. 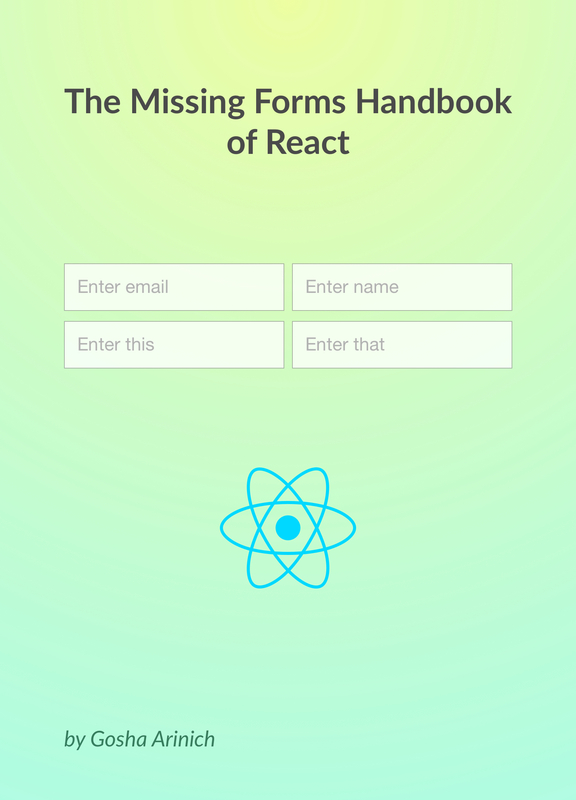 Download a free sample of The Missing Forms Handbook of React. The excerpt contains two chapters: on building an intuition for forms and on handling various form controls. I’m really getting a lot out of the book! I have been through the book twice already. Information on touched vs un-touched inputs was helpful. So were implementation details of debounce — these are tough to work through without a good overview, and the book did a great job of getting me familiar with it. The Missing Forms Handbook of React has all you need to get a more pleasureful experience from working with React and forms. Displaying only errors for fields edited by the user? Check. Validating everything when they press submit? Check. Handling server side validations? Check. Preventing double submit errors and showing indicator? Check. And much more of what you expect from modern, dynamic, friendly forms that people want to work with. I really enjoyed the book. I was doing my first step form in React for a real project. I think I did pretty well to be my first time. It was the unique course / book that I found about that specific topic (forms in React). 5/5 stars. Q: Will it teach me React? No, it is not a book on learning React, so you will need the basic knowledge of React. Q: What am I getting? It will give you a thinking framework that you can apply to building real-world forms. The practical examples, in JSBins, aid that understanding. And, it comes with way to decide for yourself whether you need a form library, and if so: which one. 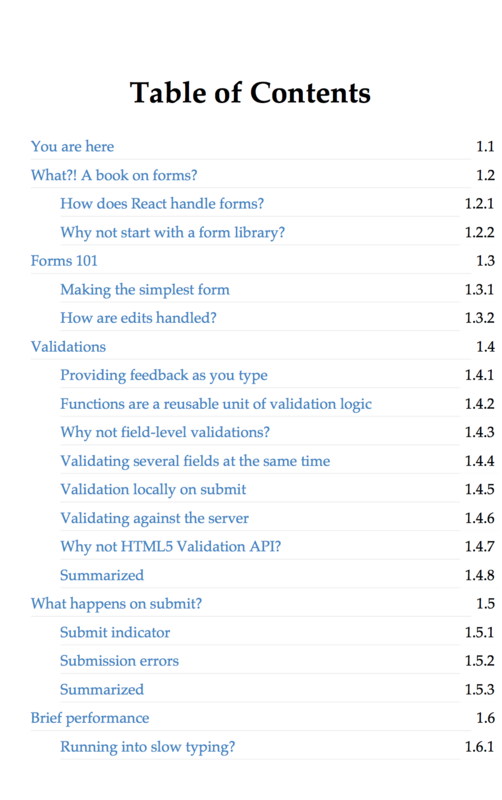 Q: How advanced is The Missing Forms Handbook of React? A lot of beginners to React are struggling with understanding forms in React. To whom how the most common form patterns can be implemented is the mystery. And they are the kind of developers this book has in mind first. The book is not about super-complex forms, it’s about making sense of forms in React. So if you can implement a form with instant validations yourself, and understand how that works, this might not be for you. Q: What format does the handbook come in? The handbook comes in PDF. Q: What version of React do the code examples use? The code samples use React 15, but don’t you worry: they could just as easily run on React 16. The concepts and approaches for working with forms are universal across React versions, and it’s those approaches that the book strives to teach. 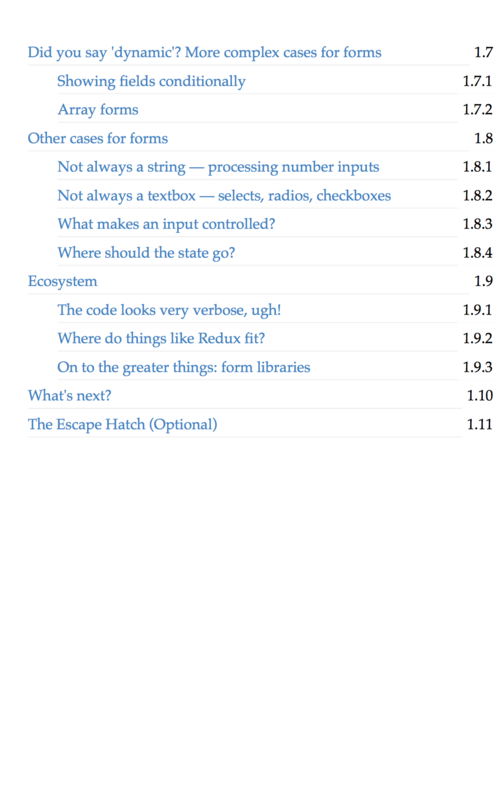 Q: Will the book teach me Formik or Redux Form or…? There is a brief section on ecosystem surrounding forms. It’s not central to the book, however. The goal of the book is to be timeless and universal. After all, how you deal with forms hasn’t changed much. There are various libraries, and there are cases for them, but you should still understand how forms work without them. I offer a 100% satisfaction guarantee. Buy the book and try it out. And if you aren’t happy, just shoot me an email and we can figure out why. Tell me your concerns at [email protected] and I will give an honest assessment of them. If you want to ask anything not covered here, drop me an email: [email protected], and I will gladly answer any questions.